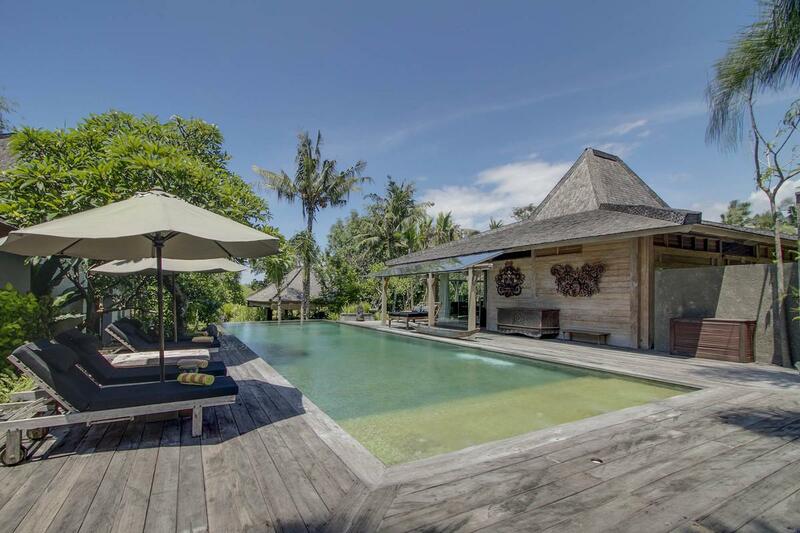 Luxury, style and breathtaking ocean views await you at Villa LuWih. 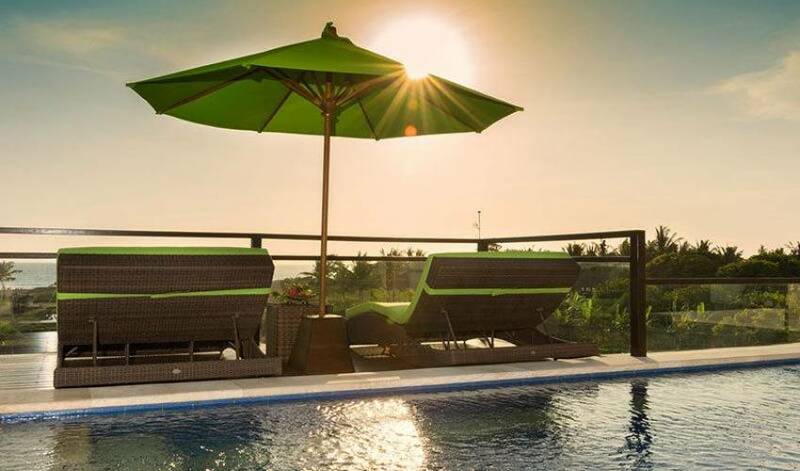 With three floors of modern comforts, six bedrooms, two swimming pools, and a team of 14 professional staff to tend to every need, this is what holiday dreams are made of. 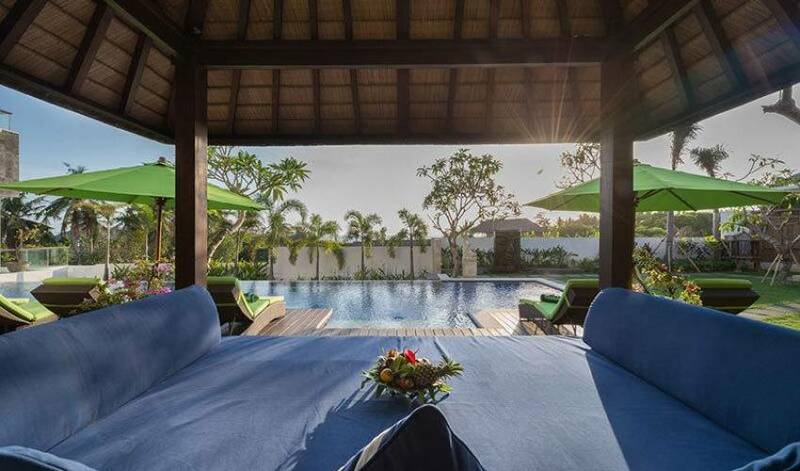 Lying in rural Canggu, only a stone’s throw from the dramatic black-volcanic sands of Pererenan Beach, famous for its rolling surf and spectacular sunsets, the villa is as ideal for groups of friends who want to party as it is for families who want to explore. 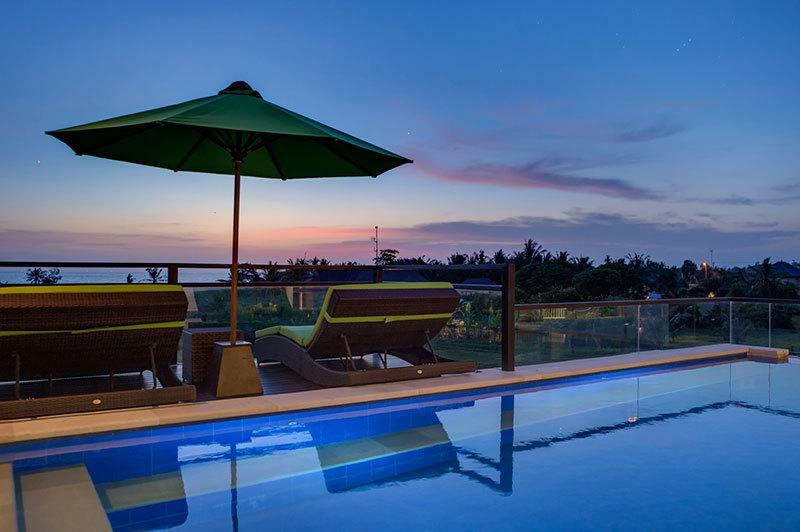 The villa has been thoughtfully designed to capitalize on its prime location overlooking Pererenan Beach on Bali’s dramatic and unspoiled south-west coastline. Angled towards the ocean and the spectacular sunsets, three floors of stylish and luxurious accommodation are fronted by acres of glass to ensure that wherever you are in the villa, you won’t forget where you are in the world. 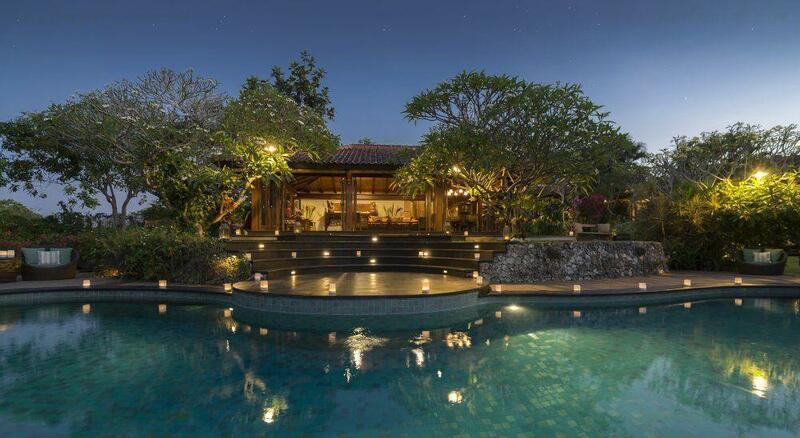 This congenial villa offers a dazzling choice of adaptable living space. From the slick poolside bar to the state-of-the art media room with its giant 60-inch TV, guests of all ages and all interests will find a place to please them. 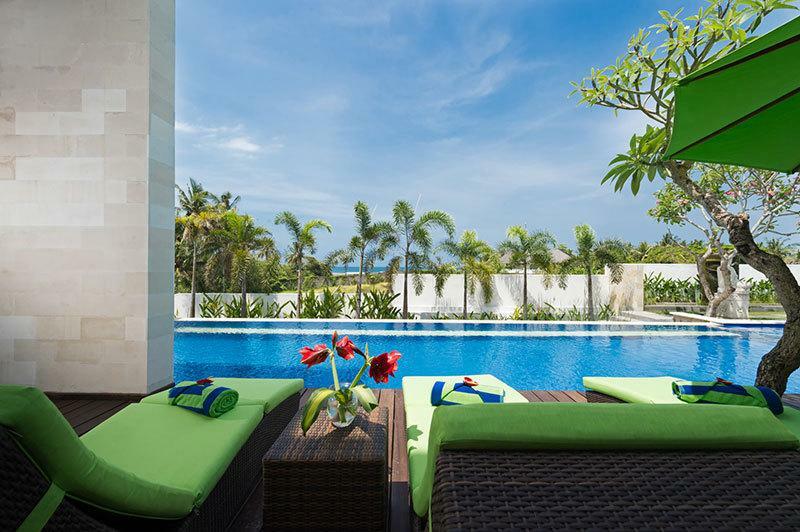 This flexibility and abundance of indoor and outdoor living space makes the villa an ideal choice for families who want to stay and play together, or friends looking for the best of both worlds – peaceful spots to spend their day and social spaces to party the night away. 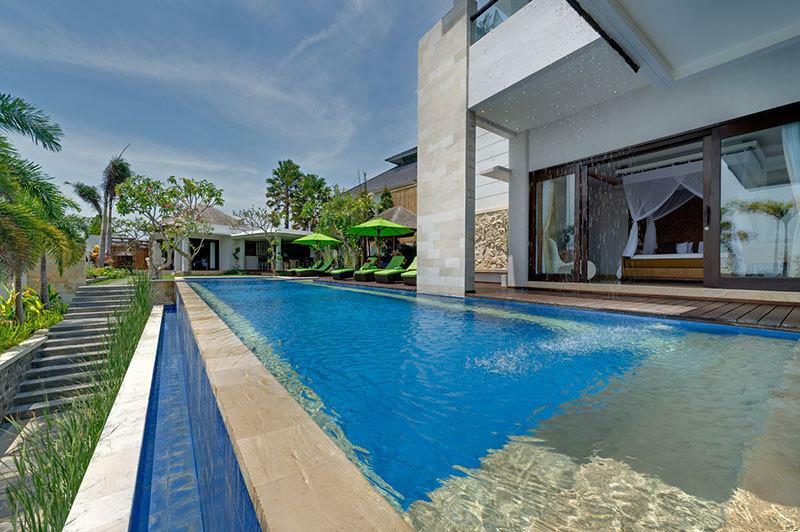 As part of its super-flexible layout, the villa offers guests a choice of swimming pool. At ground level is a splendid 16-metre lap pool, with a shallow end for the kids, a shady relaxation balé, and several pairs of brightly cushioned loungers alongside. One level up, flanked by the media room and an indoor/outdoor sitting area, is the second pool – smaller than the first, but with the best views in the house from its glass fronted depths. 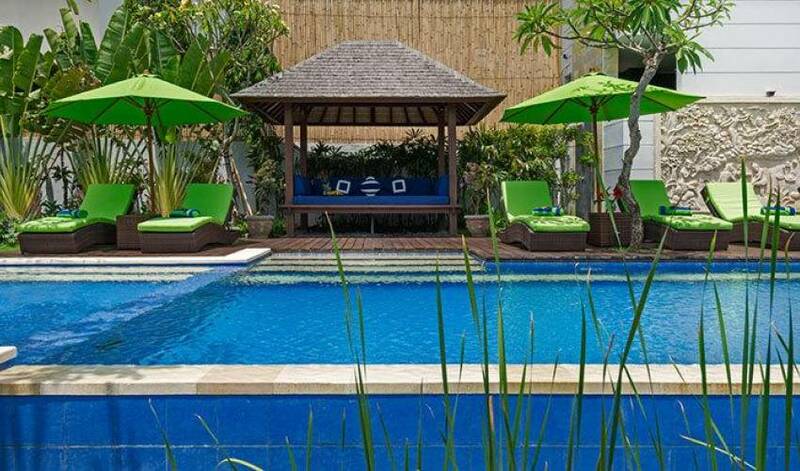 A team of graceful and welcoming staff will take care of your every need at this villa. Your villa manager will happily help with tour bookings and restaurant reservations, although with a skilled private chef at your disposal, you may be perfectly content just to stay ‘home’ and enjoy delicious meals selected from the villa’s suggestion menu. 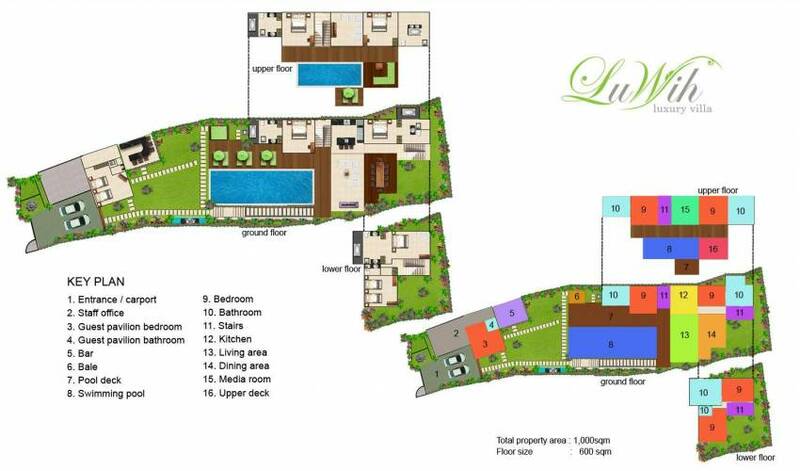 The villa’s expansive ground floor living space has the relaxed air of a stylish, contemporary beach house. Décor is simple and peppered with interesting Indonesian artefacts and natural wood pieces that echo the beach house theme. Banks of floor-to-ceiling windows on three sides of this room bring the outdoors in and provide uninterrupted views of the famous surf breaks of Pererenan beach. A huge U-shaped sofa surrounds a beautiful glass-topped coffee table with a natural wood base, and traditional Balinese stone carvings flank a 55-inch flat-screen with Apple TV. 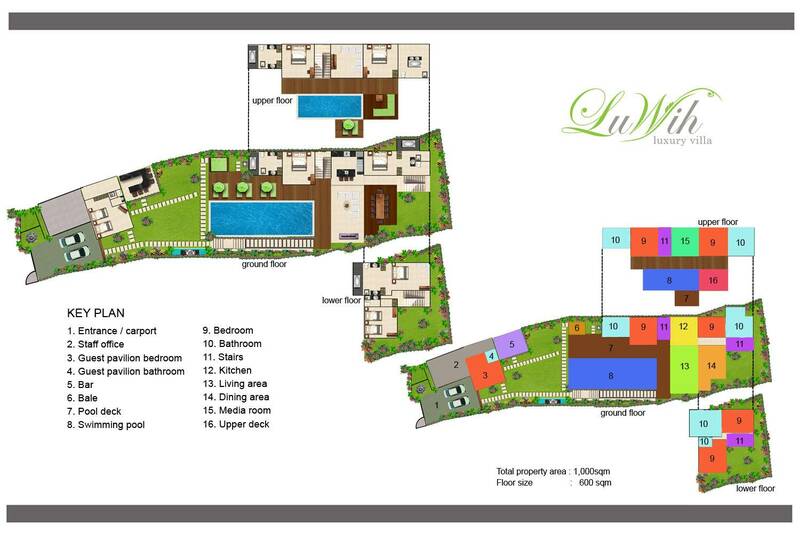 Located on the upper level and overlooking the pool is the villa’s state-of–the-art media room. 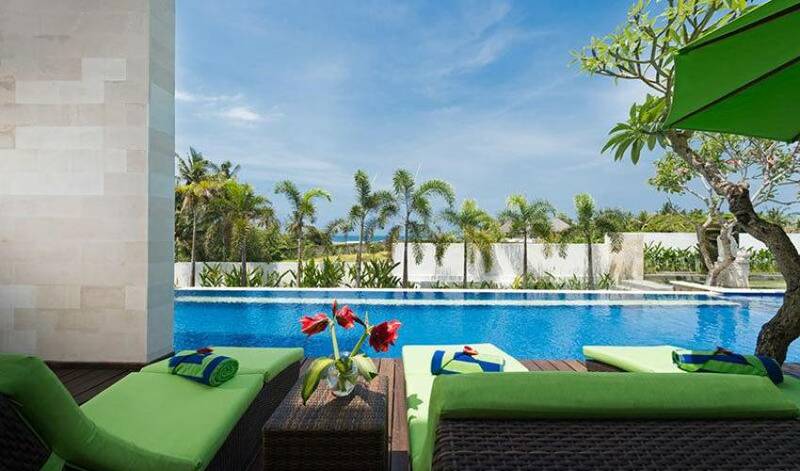 This air-conditioned space has glass sliding doors that lead out to the upper pool and has beautiful views over Pererenan Beach. Outfitted with a large, comfortable L-shaped sofa, glass topped coffee table and wooden paddle ceiling fan, this room is the place to be when you want an escape from the heat. Watch your favourite stars come to life on the giant 60-inch flat-screen TV, live out your fantasies with the latest PlayStation game, or chill to some soothing tunes on the surround-sound system. This room has it all, and is a great entertainment space for adults and children alike. A special feature is the dramatic waterfall that cascades down from the upper level swimming pool to the impressively proportioned 16 x 4-metre lap pool flanking the living area. With a thoughtfully designed 4 x 4-metre shallow area for the kids at one end, this delightful oasis will keep everyone happy. 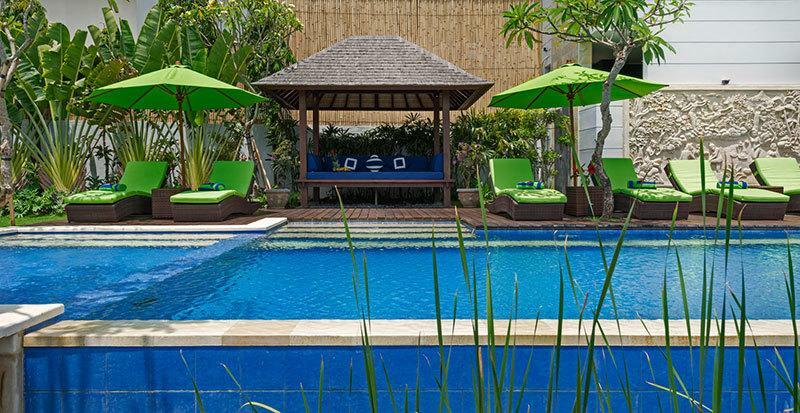 Brightly cushioned sun loungers line the west-facing side of the pool together with a shady relaxation balé that just begs you to curl up on its comfortable cushions with a long cool drink and a good book. Fringed by tropical foliage within the villa’s small but perfectly formed garden is a chic open-air bar that seems to exert an ever stronger magnetism as cocktail hour approaches and the sun begins to set. For a quiet escape and more romantic sunset views, head up to the upper level pool. At the far end of the water is a decked sitting area furnished with an L-shaped wicker sofa adorned with colourful cushions. The folding glass doors surrounding this room make it a wonderfully flexible indoor—outdoor space. On the far side of the pool is a glass-fronted balcony where two double daybeds lie poised to soak up the sun and the ocean panorama. The villa offers six spacious, luxurious, air-conditioned ensuite bedrooms, plus an extra twin-bedded room with ensuite bathroom occupying a separate pavilion overlooking the garden at the villa entrance. Intricately carved wooden panels form ornate backdrops to the beds, all of which are dressed in crisp linen, accented in brightly coloured silks and swathed in romantic white-net canopies. With marble floors, white walls and simple but elegant wood and rattan furniture, bedrooms are equipped with 40-inch flat-screen TVs and telephones. 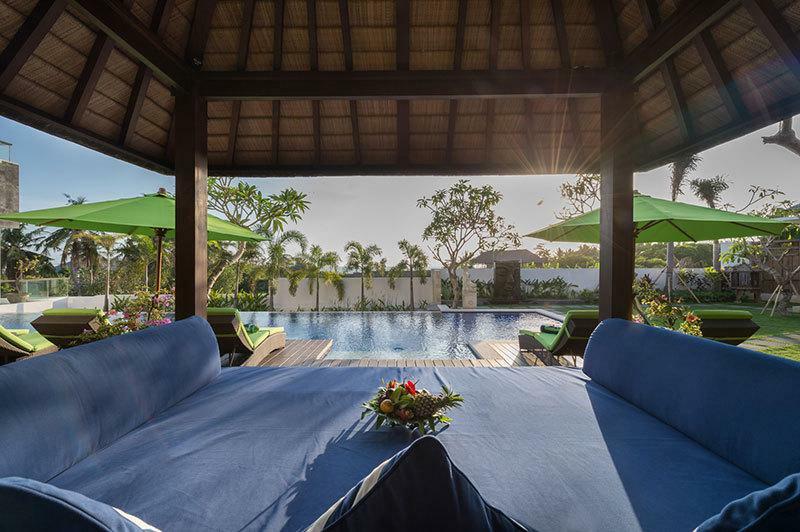 Tucked away at the end of a quiet rural lane in the district of Canggu, the villa is located just a stone’s throw from the dramatic black sands and rolling waves of Pererenan Beach – one of Bali’s most popular surfing spots. 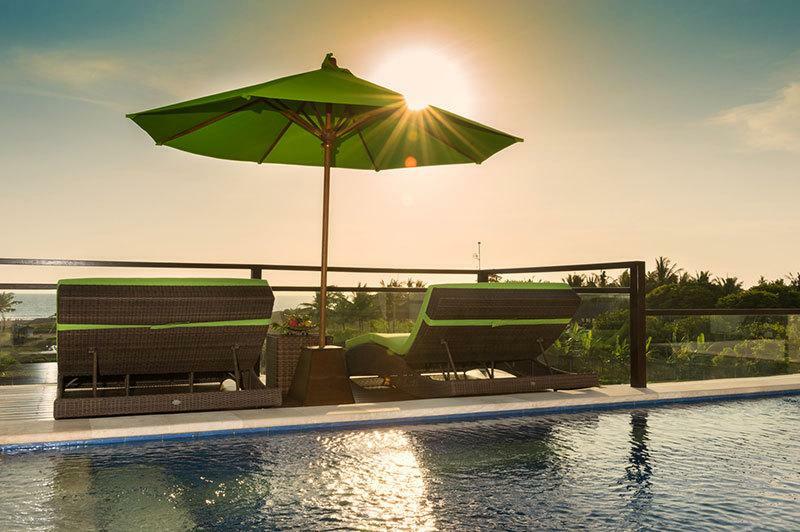 The villa is also just a short drive from trendy Echo Beach (7km) with its beachfront bars, restaurants and surf shops. Heading slightly further south down the coast is the fascinating museum-hotel Tugu, which is well worth dropping into for drinks or dinner. 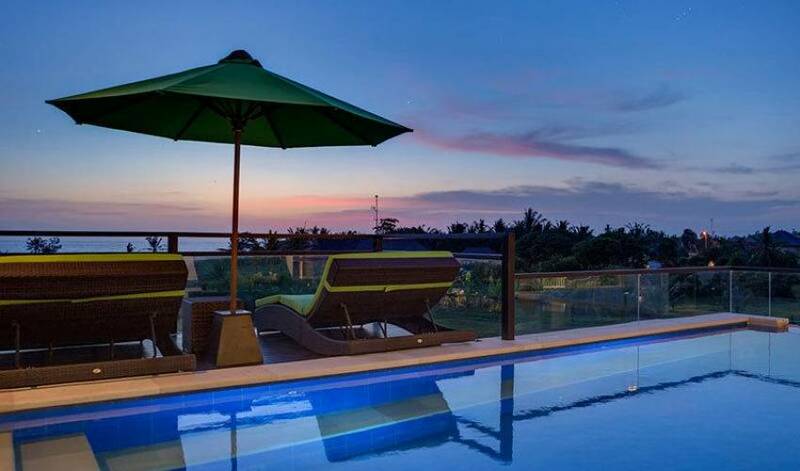 Villa LuWih is approximately mid-way between the top-rated Nirwana Bali Golf course and neighbouring Tanah Lot beach temple (both 10km), and the sophisticated shopping and dining centre of Seminyak (13km).